This year the Third Punic War started, and it started with a boon for Rome. Utica was an important city in Africa. Like Carthage, it was a Phoenician colony, but it was even older. The city always seems to have had a somewhat problematic relationship with its younger neighbour, which was located some 40 kilometres to the southeast. Even before a single Roman soldier had set foot on African soil, Utica decided to surrender to Rome. This probably happened shortly after the second Carthaginian delegation had returned from Italy and it was clear that war was imminent. The defection of Utica provided the Romans with an excellent base of operations. 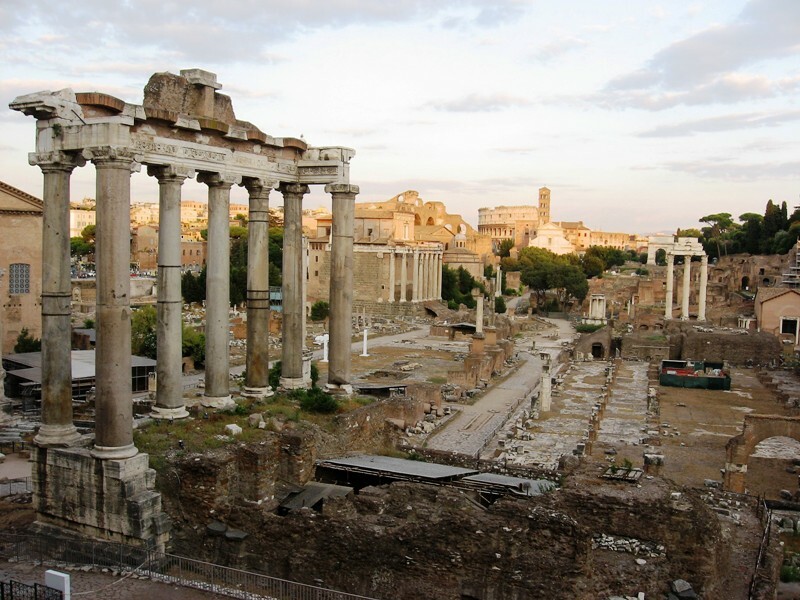 The Senate and people of Rome now formalised the decision to go to war. The comitia centuriata gave its consent and the Senate charged both consuls, Lucius Marcius Censorinus and Manius Manilius with leading the Roman army to victory over Rome’s archenemy. The former was given command of the fleet, the latter of the army. Averting a Third Punic War? Appianus claims that the Romans had gathered an army of 80.000 infantry and 4.000 cavalry. Many young men had volunteered for military service, hoping to gain rich booty and win everlasting fame. While the numbers for the cavalry seem just about right, those for the infantry may very well be exaggerated. If two consular armies were sent to Africa, then a size of 40-50.000 infantry sounds a bit more plausible. However, Appianus may have included the crews of the 50 quinqueremes and other ships that were used to transport the Roman army to Africa, and he may also have counted the servants and camp followers. In any case, this was a huge Roman army and it far outnumbered the number of fighting men that the Carthaginians had in the city and in the field. But it was also a very green army, enthusiastic, but ill-disciplined at times. And it was not just the ordinary soldiers that were inexperienced. The consul Manilius’ battlefield experience was a defeat in Spain in 155 BCE, while Censorinus’ military experience is wholly unknown. While the Roman armada sailed for Africa, the desperate Carthaginians sent a third diplomatic delegation to Rome. They had decided that their only option was to follow Utica’s example and offer an unconditional surrender (deditio) as well. When the envoys arrived in Rome, they were told that the consuls had already left. 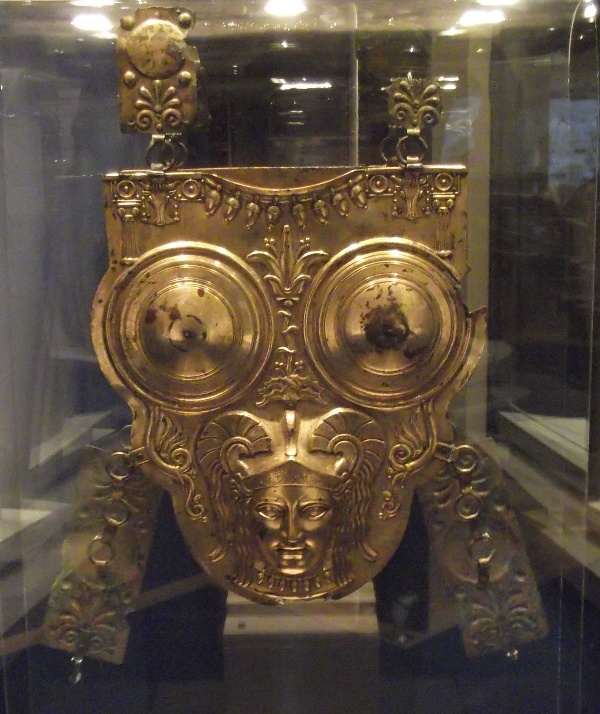 The Senate nevertheless decided to accept the deditio; the envoys were told that the Carthaginians would be allowed to live in freedom and according to their own laws, provided they immediately surrendered 300 hostages from the most important noble families in the city and shipped them to Lilybaeum on Sicily. They were also ordered to readily accept the orders given to them by the two consuls, who were by now also in Lilybaeum. It very much looked like war could still be averted. When the envoys returned to Carthage, they were greeted by the population and the general feeling was that they had done their job well. People did worry about the fact that Carthage itself had not been mentioned in the Senate’s decision. Could this mean that the Carthaginians had to go and live somewhere else under their own laws? Would the consuls really force them to abandon their ancient city, traditionally founded in 814 BCE? The Carthaginians nevertheless decided to obey any command given by the Roman magistrates and to send the required hostages to Sicily. Probably in May, they were received there by the praetor Quintus Fabius Maximus Aemilianus, who sent them on to Ostia. The hostages, some of them still very young, were interned in a converted dry-dock which had been specially built to store the former Macedonian flagship, a huge ‘sixteen’ confiscated from King Perseus (see 167 BCE; the ship had belonged to his father, King Philippos V). The conflict could have ended here, but the consuls sailed from Sicily to Africa anyway, ostensibly to give the Carthaginians further instructions. They landed near Utica and made their camp at Castra Cornelia, Scipio Africanus’ old camp on the narrow promontory east of the city (see 204 BCE). The Carthaginians sent another delegation to the camp to learn what the Romans expected of them. Censorinus and Manilius decided to give them “a daunting display of Rome’s might”. The consuls had a tribunal erected, on which they seated themselves, flanked by their legates and military tribunes. 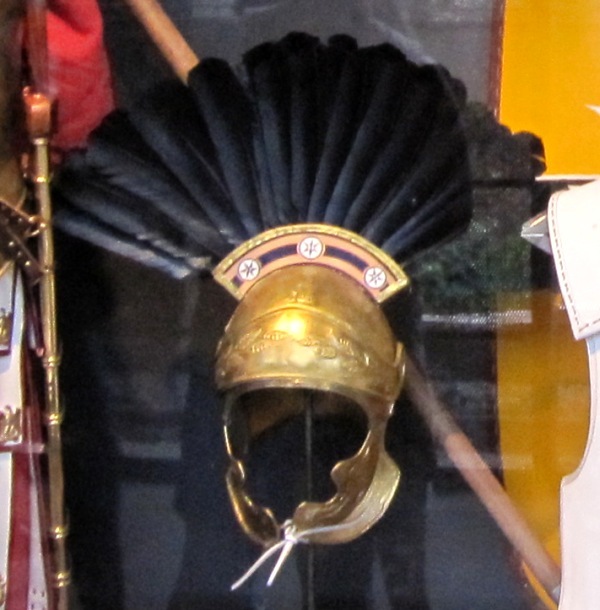 The whole Roman army was assembled around the tribunal with weapons and standards polished and gleaming in the sun. Censorinus, who had been elected first by the comitia centuriata and was older and a better orator than his colleague, addressed the envoys and told them to order the Carthaginians to surrender all their weapons and artillery. The envoys responded that they were willing to do what had been demanded, but that they were worried about the activities of Hasdrubal the Boetharch. After he had been condemned to death for his defeat against Masinissa the previous year, he had mustered a new army of some 20.000 men and could easily threaten Carthage if it had turned in all of its arms and armour. When Censorinus promised that the Romans would deal with Hasdrubal, the Carthaginians decided to comply. Thousands of edged weapons, suits of armour and pieces of artillery were handed over to the Romans, although these no doubt exaggerated the numbers to make the city they were about to destroy look all the more dangerous. Because that is exactly what the Romans still had in mind: Carthage had to be destroyed, and the Carthaginian decisions to grant hostages and surrender arms and armour did not change that. What is interesting is that Appianus claims that one of the Roman officers sent to receive the cache of arms was one “Cornelius Scipio Nasica”. It seems likely that this was Publius Cornelius Scipio Nasica Serapio, whose father had consistently and fervently opposed going to war with Carthage (see 153 BCE). Censorinus now presented the envoys with the final Roman demand: the Carthaginians were to leave their city so that the Romans could raze it to the ground. They could then relocate to a new spot within their territory and found a new city there, provided it was at least fifteen kilometres from the sea. Obviously the envoys protested and asked to be allowed to send another delegation to the Senate in Rome, but their request was rejected and they were evicted from the camp by the lictors. The envoys subsequently reported to the gerousia, probably the Council of Thirty Elders, the Senate of Carthage. News of the Roman demands caused great turmoil in the city. Some of the Elders and envoys were molested by the people, and Italians residing in Carthage were attacked by mobs. But soon the Carthaginians recovered their senses. Setting aside internal feuds, the people united to defend their city. Slaves were freed to fight for Carthage and Hasdrubal the Boetharch was pardoned. By now he had already gathered an army of 30.000 men outside the city. Another Hasdrubal, who happened to be a grandson of Masinissa, was appointed commander in the city itself. When the Romans refused to grant them a truce of thirty days in order to send a new diplomatic delegation to Rome, the Carthaginians transformed their city into a workshop of war. Swords, spears, shields, cuirasses and various projectiles for the artillery were made and the women donated their hair to make torsion ropes for the artillery pieces. United the Carthaginians stood, and united they would fall. Other than sending 20 quinqueremes to intimidate the Carthaginians by sailing past their city, the consuls had done little in terms of military action. They probably needed more time to turn their inexperienced army into a coherent fighting force, and in any case, their supply situation was far from ideal. 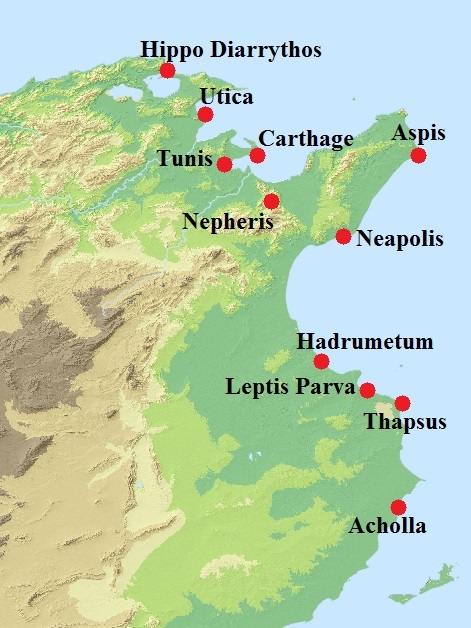 With Hasdrubal the Boetharch controlling most of the countryside, their supplies had to be transported by sea from the coastal cities of Hadrumetum, Leptis Parva, Thapsus, Utica and Acholla to the Roman camp. When things had been put somewhat in order, the consuls left Castra Cornelia and moved to the narrow isthmus leading to Carthage. They were ready for an assault on the city. The city was still a formidable obstacle, protected by some 30 kilometres of circuit walls. There was only a single wall covering the sea side of the city, but the land side, directly facing the Romans, was protected by a triple wall. Carthage’s pride had always been her harbour (cothon in Greek sources). The first part of it was rectangular and intended to accommodate merchant ships. The second part lay directly behind the first: Carthage’s famous round war harbour, with a capacity of 170-220 warships and an island in the centre with the admiral’s quarters. The harbour mouth obviously necessitated an opening in the outer city walls, but the cothon itself was well protected by interior walls and steep embankments. Carthage would be a very tough nut to crack for the Roman army. Manilius attacked the city from the isthmus while Censorinus advanced against the walls from the sea. Twice the Roman attack was repulsed after some fierce fighting. The consuls, weary of an attack by Hasdrubal the Boetharch and his army, now decided to make two fortified camps on the isthmus. 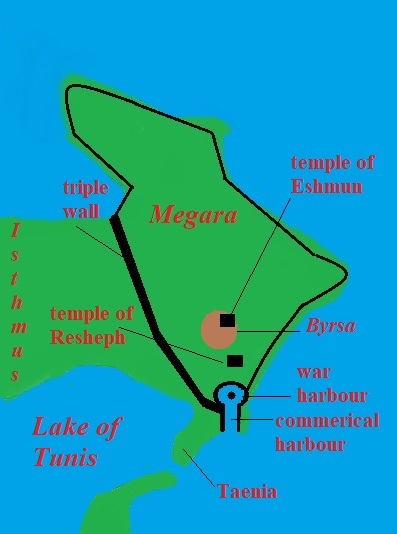 Censorinus’ camp was located directly on the Lake of Tunis. When his men crossed the lake to fetch wood for constructing siege engines, they were suddenly attacked by the talented Carthaginian cavalry commander Himilco Phameas, who cut down some 500 of the woodcutters. The Romans nevertheless managed to make some battering rams and ladders, but the renewed attack on the city failed to make any headway. Censorinus then brought forward two gigantic battering rams. The first had a crew of soldiers, the other was manned by sailors. Encouraging competition between the army and the fleet, the consul directed the two rams against the walls. Although a section of the wall was breached, the Carthaginian defenders repulsed the attackers and tried to repair the damage. With incredible courage, they then sallied during the night and managed to knock out the rams for the moment, although they did not succeed in destroying them. In the morning, the Romans noted that the breach had not completely been repaired and that it would still be possible to break into the city. Some of the defenders were only armed with stones and clubs. Disdainful of their opponents, the Roman storming parties rashly surged into the city. Only Scipio Aemilianus, then serving as a tribune, held his men back. And for the better, as the other storming parties were quickly overwhelmed and driven back by the defenders. Scipio’s men made sure most of them could escape from the city again unscathed. It was now late July and the Romans had not achieved anything. To add insult to injury, disease broke out in Censorinus’ camp. The consul therefore decided to move it to the Taenia, the tongue of land south of the city between the Lake of Tunis and the sea. The Carthaginians observed the Romans crossing the lake and attacked the Roman ships with primitive fireships, causing serious damage. The crossing was Censorinus’ last action in Africa. He soon returned to Rome to preside over the next consular elections and command of all armed forces devolved to Manilius. Although the latter’s incompetence was probably exaggerated by Polybius and Appianus, he certainly did not perform very well. A Carthaginian night attack on the Roman camp caused much confusion, and calm was only restored after Scipio Aemilianus had galloped out of the rear gate and driven off the attackers with a band of horsemen. The night attack caused Manilius to fortify his camp and to protect the location where his supply ships docked with a fort. The consul then decided to peel off 10.000 infantry and all of the cavalry and send them out to devastate the countryside. The campaign was also intended as a large-scale foraging expedition, but Roman discipline was still quite poor. Frequently the Romans were spread out too thin and then attacked by Himilco Phameas and his bands of swift and agile cavalry. Only Scipio was said to have properly protected his foraging parties with his foot soldiers and horsemen. All in all, the campaign in the countryside was hardly a raging success. The year was now almost over. After another night attack on the Roman camp, Manilius decided to confront the Carthaginian field army under Hasdrubal the Boetharch, which was camped at Nepheris. The terrain was rocky and difficult, and in order to reach the enemy army, the Romans had to cross a river with steep banks. Manilius decided to attack anyway and managed to push Hasdrubal’s forces back after a sharp fight. The Romans, believing themselves to be victorious, then tried to cross the river again. Since there were few places where the stream was fordable, they had to break ranks, giving Hasdrubal an opportunity for a ferocious counterattack. The Carthaginian general and his troops charged into the helpless Romans, cutting many of them down, including three military tribunes. It was once again Scipio who was said to have saved the day. Taking 300 horsemen with him, he charged the Carthaginians and peppered them with javelins. This gave the Roman infantry a chance to cross the river. It was then discovered that four maniples of infantry were still trapped on the other side. When Hasdrubal attacked, they had retreated to a hill where the Carthaginians now surrounded them. Although some of the senior officers were in favour of abandoning these men, Scipio protested (and likely quite a few others as well). In the end, Scipio was given a few turmae of horse and two days’ rations. He then crossed the river, and although he was outnumbered by a large margin, he managed to extract the trapped soldiers. There was much joy that these men had been rescued, but the expedition had nevertheless been a disaster. While the Romans were marching back to their camp on the isthmus, they were once again attacked by Himilco. And to add insult to injury, the citizens of Carthage staged a new attack from the city on the camp and killed some of the servants. The first year of the Third Punic War had been a catastrophe for the Romans. Coin of Andriskos as Philippos VI (source: Classical Numismatic Group Inc., CC BY-SA 2.5 license). The kingdom of Macedonia had been split into four separate republics after the Third Macedonian War (see 167 BCE). These were in effect Roman client states. The Romans had lowered the taxes, but that did not mean they were popular among the population. This year, a noted troublemaker took control of Macedonia and started to rule it as King Philippos VI. His real name was Andriskos and his background is fairly obscure. He seems to have been a man of low birth and a native of Adramyttion in Aeolis, Asia Minor. The second century CE satirist Lucianus of Samosata called him a fuller. But this Andriskos was far from stupid. He seems to have been a good actor and managed to convince people that he was in fact Philippos, the son of the late King Perseus who had been deposed by the Romans. The Roman historian Florus, who called Andriskos “a man of the lowest origin” and was not sure whether he was “a freeman or a slave”, wrote that the man even looked a lot like Philippos. Of course the real Philippos had died in Alba Fucens, Italy, in the 160s, and that is why Andriskos is called the Pseudo-Philippos in many sources. In the late 150s, Andriskos travelled to the court of the then king of the Seleucid Empire, Demetrios I Soter. Demetrios did not trust him one inch and sent him on to Rome. The Romans detained him, but the cunning Andriskos managed to escape. Diodorus Siculus claims that he sailed to Miletos in Asia Minor where he continued to play the part of legitimate king of Macedonia. Although he was at first incarcerated by the authorities, they later released him again, believing that his act was harmless. Andriskos then even managed to befriend the wife of Athenaios, the brother of King Attalos II of Pergamum. But Andriskos’ future did not lie in Asia Minor. He crossed over to Thrace and linked up with a Thracian chieftain named Teres, who ruled over the tribe of the Odrysians. 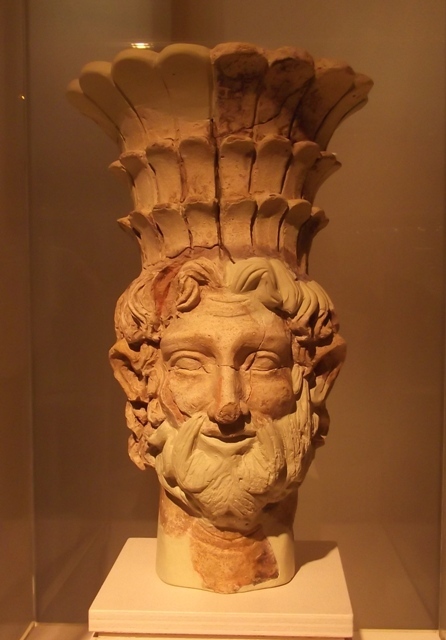 Teres may have been a son of Cotys, the chieftain who had been an ally of King Perseus. This certainly explains why Andriskos was given a warm welcome in Thrace. Several of the Thracian tribes provided the fake Philippos with troops and soon he had gathered an army with which he could threaten Macedonia. The four republics responded by calling up the militia, but their inexperienced troops were quickly defeated in a battle fought in the territory of the Odomanti, a Thracian tribe that lived beyond the river Strymon. After his victory Andriskos crossed the river and one by one the four republics fell into his hands. Andriskos officially proclaimed himself King Philippos VI and began issuing coins with this name (without the number of course, this is a modern convention). His rule seems to have generally been accepted by the Macedonian population. Polybius rather naively believed that the Macedonians had had no cause for complaints against the Romans, who had given them freedom and prosperity when they had abolished the centuries-old monarchy and had lowered the taxes. The historian also claimed that Andriskos was a cruel man, guilty of sending people into exile, torture and murder. 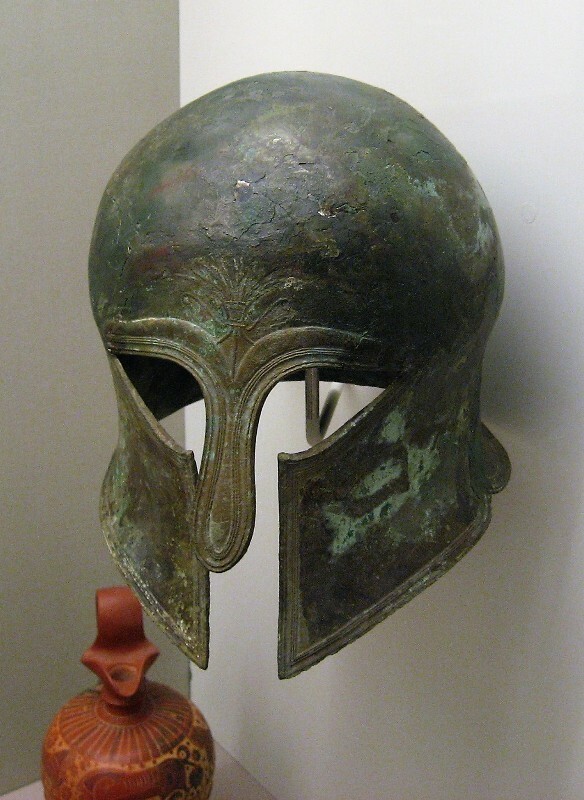 The truth seems to have been a bit more complicated, and many young men were willing to fight for Andriskos, who now began to threaten Thessaly, which had traditionally been under Macedonian control. The Romans could clearly no longer choose to sit on their hands and decided to send a praetor with an army to the region. This praetor was Publius Juventius Thalna, likely a relative of the praetor who had wanted to declare war on Rhodos in 167 BCE. Thalna would regret the day he had been sent to Macedonia. An important constitutional development this year was the Lex Calpurnia de repetundis. The law had been proposed by the people’s tribune Lucius Calpurnius Piso Frugi. It set up a permanent court in Rome – a quaestio perpetua de repetundis – that could be used by non-Roman inhabitants of the provinces to sue provincial governors and formal governors for maladministration and extortion; repetundae basically means ‘recovery of extorted money’, and this was the original penalty if the accused was condemned. The court was presided over by a praetor and the decisions were taken by jurors drawn – at that time – from the senatorial order. This meant that members of the senatorial order – almost all provincial governors were senators – were judged by their peers. Although provincial governors had been brought to trial before for maladministration (see 171 BCE), those cases had been heard by special ad hoc courts. The quaestio perpetua de repetundis on the other hand was, as the name suggests, a permanent court. The composition of the juries would later become a subject of fierce debate, as for now equites and members of other classes were presumably excluded. Piso’s colleague Lucius Scribonius Libo tried to get the former praetor Servius Sulpicius Galba condemned for his massacre of the Lusitanians the previous year. As there was no court for ethnocide, the case was brought before the popular assembly, possibly after a debate in the Senate. Cato the Censor, now about 85 years old, vehemently supported the charges. Quintus Fulvius Flaccus, a former consul notorious for his failed campaign in Spain in 153 BCE, supported the accused. Galba was known for his skills at oratory, but it was soon clear that he would not be able to talk himself out this trouble. His claim that he had acted in self-defence was more than a little incredible. When he was about to be condemned, he had his children brought in and shed many tears. Among these children was the young son of Gaius Sulpicius Gallus (the consul of 166 BCE), an orphan whose guardian Galba had become. The children cried so loud and aroused so much pity, that the case was ultimately dropped, with Appianus suggesting that bribery was involved. The trial does not seem to have hampered Galba’s career, as he was elected consul five years later. The Senate furthermore sent a diplomatic delegation to Bithynia to mediate in a dispute between King Prusias II and his son Nikomedes. The composition of the delegation demonstrated that the senators did not consider this an important mission. The three-man delegation comprised a man who could barely walk because of his gout, a man who had suffered serious head injuries when he had been hit by a tile (in one version: while entering a brothel) and a man who was generally held to be the stupidest man in all of Rome. Cato believed that these envoys would not be able to accomplish anything and caustically remarked that the delegation did not have feet, a head or a heart (in Livius’ version: brains). And indeed, in spite of the Roman diplomatic intervention, Nikomedes succeeded in killing his father with a little help from King Attalos II of Pergamum. He would rule Bithynia as Nikomedes II Ephiphanes. 149 BCE was also the year in which Cato the Censor died. The great politician, soldier, farmer, historian, lawyer and orator passed away at the ripe old age of 85. For many years he had advocated the destruction of Carthage. He had lived to see war being declared, but unfortunately for him he did not live to see Rome’s nemesis going up in flames little more than two years after his death. Polybius, The Histories, Book 36.1-36.15. Richard Miles, Carthage must be destroyed, p. 339-343. 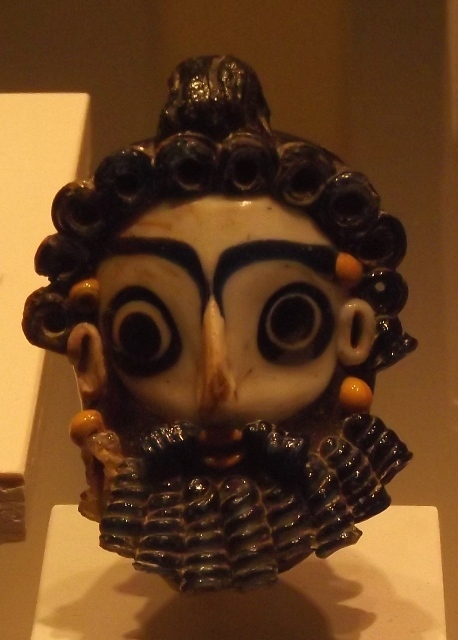 Marcius served as censor in 147 BCE and that is how he acquired his cognomen. Strictly speaking, the use of this nickname for 149 BCE is an anachronism, but I will use it anyway for the sake of simplicity. The crews of these ships would actually join in the fighting. See Censorinus’ attack of this year and Mancinus’ attack of 147 BCE. Adrian Goldsworthy, The Fall of Carthage, p. 338. Richard Miles gives the capacity as 170 ships (Carthage must be destroyed, p. 2 and again p. 326), while Appianus wrote that the war harbour could accommodate 220 ships (The Punic Wars 96). Perhaps it depended on the size of the ships, as it is not inconceivable that multiple smaller ships could share one berth..
 Actually his half-brother, whom he had adopted as a son. Mentioned by Cicero in In Verrem 2.3.195.